When you're writing a game on your own it's easy to get too ambitious for your own good - you can have a vision for a massive complete game but quickly fall short or give up entirely as you lose interest in it. 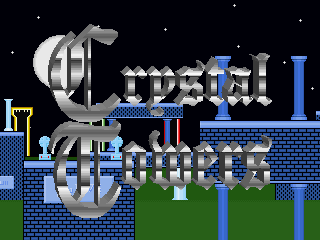 I'd always wanted to make a platform game of decent length along the lines of the original Sonic or something, but never had the staying power to complete one - Crystal Towers was a big step in size of project for me. The game stars Bernard, the night watch man at the Column Temple who wakes up from his usual nap to find that the Life Crystals he's been guarding have been stolen. The journey to retrieve them goes across a branching path through ten worlds of two levels each, and there's a choice of four difficulty levels (which people have since told me would better be called "Hard" and going up to "Impossible"). 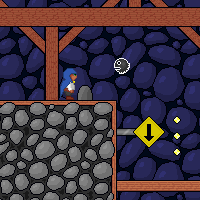 This game took a year to complete and was the first one that I made mostly in Multimedia Fusion, as opposed to just using it to compile Games Factory games. 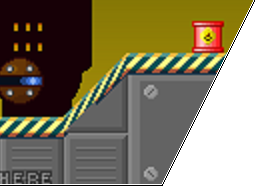 Bernard's sprite and some other backgrounds were drawn by my brother, and I did the rest of the graphics and music. It was also the first time that I'd attempted a custom movement, which looks fairly buggy looking back on it, but it did its job. I think that one of the pieces of feedback I loved the most came from this game - someone emailed me to say how much his daughter loved the sound effect when you fall off the bottom of the screen, and wanted him to play "the little blue guy game" whenever he was on the computer!